Honeysuckle01263 715779work01603 870304fax Self-cateringThis delightful Shepherds Hut is set on Applewood Park and has been beautifully finished. This is perfect for a family holiday especially with Banham Zoo being so close by. • Other: Towels, Games and books, Hairdryer, WiFi, Welcome tray, Discounted passes to Banham Zoo for use during your stay. Washing and drying facilities available in communal area - tokens to be purchased from reception. Travel cot and Highchair available on request. This delightful Shepherds Hut is set on Applewood Park and has been beautifully finished. 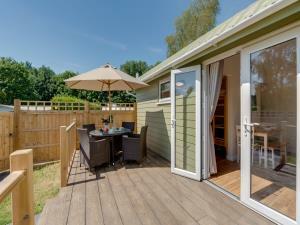 This is perfect for a family holiday especially with Banham Zoo being so close by.